Officials from JetBlue Airways said during a conference Thursday the carrier would “disrupt” traditional service from the United States to Europe by offering its business class service. According to CNBC.com, JetBlue president and COO Joanna Geraghty said during the Skift Global Forum that while the airline hasn’t decided whether it will add service to Europe or not, the discussion has continued for more than two years. JetBlue already offers flights to Latin America and the Caribbean, but officials from the airline believe the key to making the move into the European market would be offering business class service that low-cost carriers like WOW Air and Norwegian do not. “When we think about trans-Atlantic, we do think we can disrupt largely around a Mint-like product because we’ve been so successful on flying to the West Coast with Mint,” Geraghty said during the conference. Aviation expert Samuel Engel told CNBC.com that JetBlue would offer something different than the other carriers if it were to implement service to Europe. 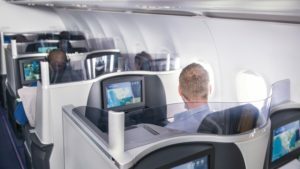 While the airline’s business class would make it an appealing option, the other carriers serving the same routes are expected to implement changes to keep their customers.